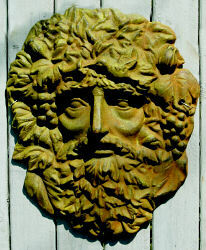 The Green Man symbolizes irrepressible life, renewal and rebirth, the eternal cycle of life, death and regeneration. With the accompaniment of leaves and vegetation surrounding the head, it also represents the union of mankind with nature. Constructed of cast iron with a rustic finish.